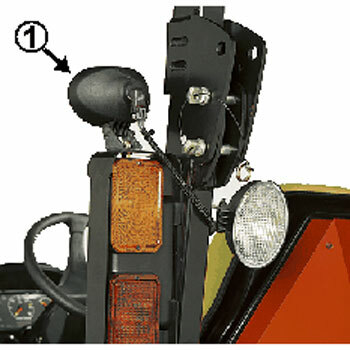 The forward-lighting kit (1) for open-station tractors only provides extra visibility when working in dark conditions. Lights attach to the brush guards, located on the rollover protective structure. Each kit contains two lights. Requires BLV10400 light-brush guard kit (3032E, 3038E, 2025R, 2032R, 2320, 2520, 2720, and 3000 Twenty Series). Requires LVB25236 light-brush guard kit (4000 Twenty Series). 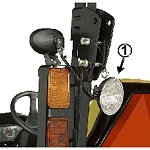 Requires BLV10400 light-brush guard kit (MY2013 1023E, 1026R, and 1025R Tractors), and LVB26026 rear-work light-harness kit (1023E Tractor). Bought these for my 2032r. Installation was fast and easy. Worked great. Only annoyance is you have to remove the reflector bracket from rear of tractor ROPS to feed light cable down the ROPs. But I can put the reflector on the backhoe and have one built into the ballast box. The lights work great. Also seek out the Artillian Horse Blinders -- a great addition to these lights. 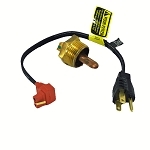 Put these on my 3038e and installation was a breeze. Ran the wires down the ROPS tube and plugged them into the per wired harnes. The light control on the dash now controls these too. Lights up a much greater area and can be adjusted to open your field of view. A must have.